‘Smile makeovers’ can transform your smile and self-confidence. They’re one of the most popular procedures in dentistry right now, and – having been a celebrity staple – are catching on amongst the general public. 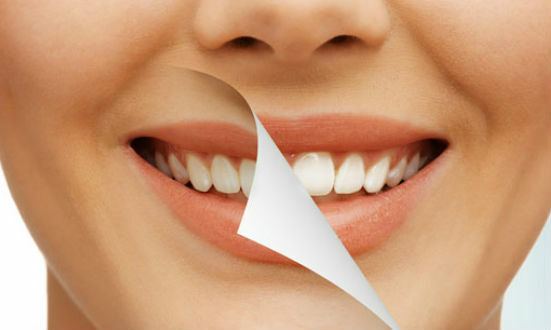 We can restore, reshape and replace your teeth, whiten and straighten them. 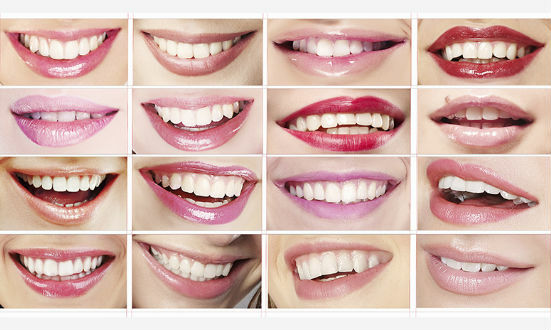 But each smile makeover we do is unique, based on your teeth, your needs and what you want to achieve. After a talk with you to hear what you don’t like, we’ll make some suggestions about how we can improve your smile, make a cast of your teeth, and order a ‘wax up’ of the work, so we can plan the perfect smile for you. We use a variety of innovative treatments to restore and rejuvenate your smile, from teeth whitening and white fillings to veneers, crowns and bridges, dental implants, cosmetic dentures, gum re-contouring and orthodontic treatments. The process begins with a consultation with our treatment coordinator, who will talk you through some of the cutting-edge treatments and techniques that we use in our smile makeovers. It always helps if you have a clear idea of what you’d like to achieve, so it’s a good idea to make a note of things you both like and dislike about your smile before you come. 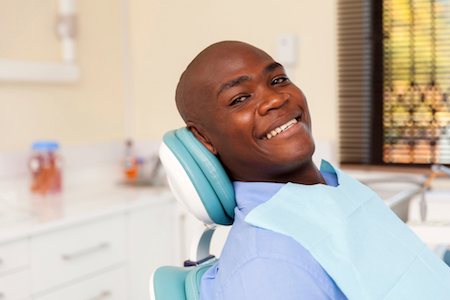 Next we will carry out a thorough dental exam, to determine which treatments are most suitable for you. Once we have discussed and agreed the appropriate treatments with you, we will order your wax up, so you can see what your smile will look like after your treatment, before agreeing a schedule with you. Once your dental work is nearing completion, we can re-contour your gums – if they need it - to make sure your gum line is neat and symmetrical. This will show off your smile makeover to the best effect and is completely pain free, adding the finishing touch to your perfect smile. Dental implants are an increasingly popular alternative to dentures and bridges, giving a permanent, natural-looking and firm solution to gaps left by missing teeth. Secure and comfortable, they can last a lifetime with proper care. And you can look forward to eating your favourite foods again, and feeling like you’ve got your original teeth back. Dental implants are made from titanium, and placed in the bone of the upper or lower jaw to act as an anchor for a replacement tooth. They don’t need teeth on either side to support them (like traditional bridges), which preserves more of your natural teeth. 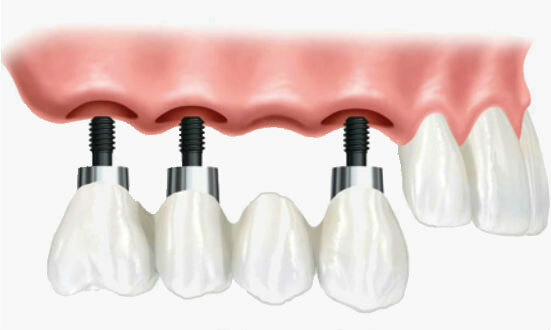 The implant bonds with the bone, making the new tooth completely secure, before a crown is build to fit over the top. • Improved appearance, comfort and speech. • Protection of your remaining natural teeth. • Brushing and flossing as easily as your natural teeth. • No grinding of your remaining teeth to attach a bridge. • Secure dentures and confidence. A replacement tooth looks, feels and functions like a natural tooth, whilst preserving the integrity of your facial structure, which can begin to collapse if the bone structure isn’t preserved. Dental implants don't suffer from any of the problems of traditional dentures such as, looseness, sore spots, trapped food or slippage etc. Dental Implants provide patients with a more natural bite increasing the types of food patients can eat. This also has a beneficial effect on your general health, as patients with dentures and bridges often struggle to eat fruit and vegetables, which has a knock-on effect on their health. Dr Liam McGrath is an expert in his field, and the Church Lane team will thoroughly examine your mouth before putting you forward for dental implants, including x-rays and making dental models. Call the practice today on 01942 726494 to talk to us about dental implants. Q. Straight teeth in 6 months, how is this possible? A. Six month smiles clear braces are safe, comfortable, and provide quick results because they only move teeth that show when you smile. Using proven techniques and materials, the braces have been specifically designed for adults with crooked, spaced, or misaligned teeth. Q. Does everyone really finish in 6 months? A. Six months is the average treatment time. Most patients finish right around six months, but treatment times may range from 4-9months. A. Yes, as with all orthodontic treatment, a retainer is necessary to maintain the new, straight position of your teeth. There are a variety of retainer options you can choose from depending on your personal preference and situation. A. There is no catch, if you are an adult patient with crooked, spaced, or misaligned teeth, then this could be a fantastic option for you! Ask your dentist today if you are a candidate for Six Month Smiles. Teeth whitening is a very easy way to make you appear younger, and can help boost your confidence with minimal time and effort. Whitening can remove staining, caused by red wine, coffee and cigarettes. As we age, our enamel can become thinner, making teeth appear yellow – or in some cases grey. Teeth whitening can be used to counteract this natural sign of ageing. Teeth whitening often goes hand in hand with other dental procedures, and is a great accompaniment to veneers, crowns, bridges or a complete smile makeover. We use Enlighten, one of the most effective teeth whitening treatments on the market, which can lighten teeth by up to ten shades, regardless of your starting colour. It works through a combination of deep bleaching at home and in-surgery bleaching, yet remains a more delicate – though just as effective treatment – even for patients with sensitive teeth. Simple yet effective, teeth whitening can last up to eight years if cared for properly. Teeth whitening treatments can also be topped up whenever you feel the need, be it a special occasion, or to complement other dental or rejuvenation procedures. We can repair a range of problems associated with broken, damaged or weak teeth using crowns, veneers or bridges. Designed to blend uniformly with your natural teeth, our team of dental experts will advise you on the best solution for you. Crowns – as the name suggests – sit on top of a damaged tooth, and are usually fitted when a patient needs a large filling, or the tooth has been weakened in some way. They both strengthen the damaged tooth, and protect it from further decay. Crowns are made from porcelain, and custom-fitted to your tooth, designed to blend in seamlessly with your natural tooth colour. Veneers are an immediate, easy and accessible solution to stained, chipped or uneven front teeth, giving you an even, natural appearance with minimal adjustment. They are made from a thin shell of porcelain that we bond to the front surface of your tooth, and can improve the colour, shape and position of your teeth. Veneers can also correct a tooth that is out of position, or close small gaps where braces aren’t suitable. Our veneers give you an even, but natural smile – we’ll choose the precise shade of porcelain to match and enhance your teeth. Veneers also require very little tooth preparation, so you’ll usually only need two visits to your dentist to get the smile you’ve always wanted. 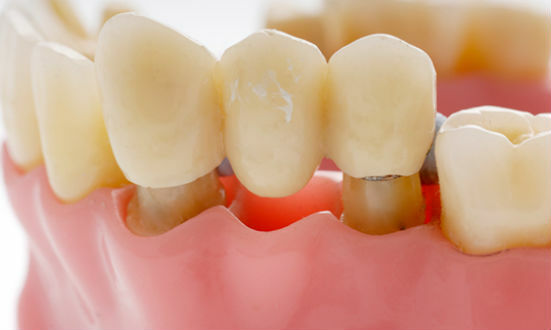 Bridges replace missing teeth without the need for a dental implant, restoring your smile and confidence. We fit different types of bridge according to the condition of the teeth around your gap, and how many teeth are missing. They can be fixed by a crown on either side (a traditional fixed bridge), on just the one side (a cantilevered bridge), or a Maryland bridge, which uses metal fittings hidden behind your teeth to keep the bridge in place. 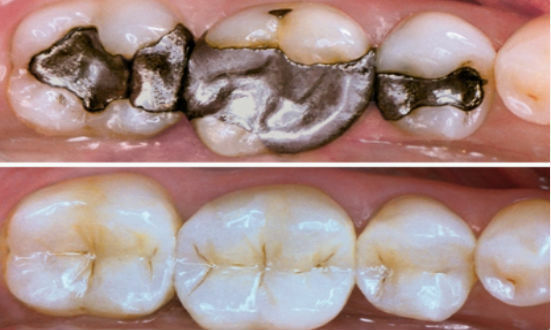 Lots of us still have silver fillings from when we were younger, which are not only unattractive, but can be susceptible to breaking. Church Lane will restore your old silver (amalgam) fillings, replacing them with a bonded white filling, matched to your natural tooth colour. Not only do white fillings restore the natural appearance of your tooth, but are mercury-free, avoiding the health concerns some people may have about old silver fillings. We can both replace old fillings, and put white fillings into new cavities, which requires less removal of your natural tooth, helping maintain your tooth’s original strength. White fillings can be used to repair chipped and broken teeth, reshape teeth, and rebuild your tooth structure. They also come in a variety of shades, gently restoring and improving your tooth’s natural appearance. It may sound simple, but prevention is always better than a cure. 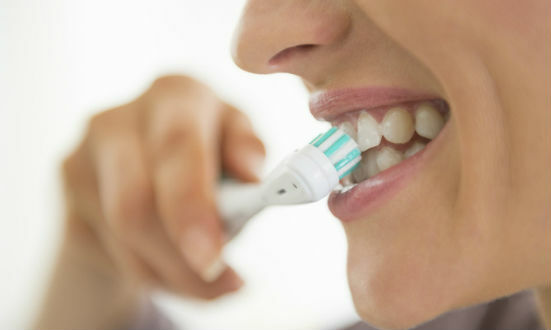 Dentist or no dentist, good dental hygiene is one of the most important things you can do for your mouth. Gum – or periodontal – disease is the main cause of tooth loss; there’s also new evidence that suggests it may be a risk factor in heart disease and strokes, low birth weight babies, and is inter-related with diabetes. Periodontal disease can’t be cured, but can be managed by regular appointments with a dental hygienist and good oral care. Have a look at our practice membership for more information about our scheme for regular patients. • Makes teeth look whiter, without the need for whitening them. • Improves confidence, helping you look and feel better. • Improves your general gum health, helping you keep teeth for longer. • Helps you look younger and healthier. We also stock a large range of oral hygiene products at Church Lane, and our team can advise you on the right ones to take away. Many people have missing teeth that they are conscious of, and gaps in the mouth have an effect on the way we talk, eat, and even the shape of our face. Dentures dramatically improve the appearance of missing tooth gaps in the mouth – we can fit either complete or partial dentures, and implant-retained dentures. 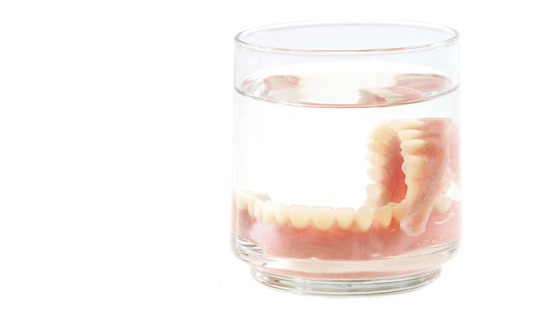 Depending on your needs, preferences and dental history, we fit standard acrylic, cobalt chrome or Valplast flexible dentures, as either full, partial or implant-retained dentures. If you have any questions about our dental services, please feel free to call on 01942 726494. Alternatively you can book yourself in for a free, no-obligation consultation with our treatment coordinator. We offer a variety of treatments & services, if you would like to discuss any of them in more detail please call the surgery and one of our team will be happy to help. Call us today on 01942 726494 to arrange a free, no-obligation consultation with our treatment coordinator.